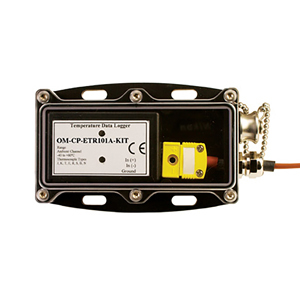 The OM-CP-ETR101A-KIT comes assembled and includes a data logger, temperature sensor (thermocouple Type K), waterproof NEMA 4 (IP65) enclosure suitable for outdoor use, USB interface cable, and software. Setup is fast and easy. The OM-CP-ETR101A-KIT is suitable for a wide range of outdoor applications including profiling the exhaust gas temperature of tractor trailers, buses and trucks. Simply mount the enclosure containing the data logger to the vehicle and insert the included type K thermocouple probe into the vehicle exhaust pipe using a compression fitting. The data logger can then record a complete exhaust gas temperature profile that can be used in the selection of the correct diesel particulate filter (DPF) for the vehicle. Using the included software, the logger is programmed to record for a set period. Data is stored in the data logger, and is downloadable at any time via a pc or laptop computer. The storage medium is non-volatile solid state memory, providing maximum data security even if the battery becomes discharged. Its small size allows it to fit almost anywhere. Data retrieval is simple. Plug it into an available USB port and the easy to use Windows® software does the rest. The software converts your PC into a real time strip chart recorder. Data can be printed in tabular format and can also be exported to a text or Microsoft Excel® file. Trigger Settings: High and low limits may be set for the thermocouple channel. Once data meets or exceeds sets limits, the device will record to memory. Bi-level start and stop triggers can also be programmed. Users can specify the number or readings to take after the device triggers. 참고: Comes complete with 3.6 V lithium battery, OM-CP-IFC200 Windows software, 1.8 m (6') USB interface cable, thermocouple probe, waterproof enclosure and operator’s manual.